5x HOT FIREPol® GC Master Mix is designed to provide highly specific high-yield amplification of GC-rich templates. 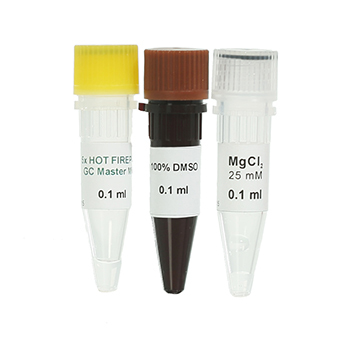 Master Mix is a ready-to-use solution containing all reagents required for PCR (except template, primers and water). 100% DMSO and 25 mM MgCl2 are included in a package in separated vials. 04-33-00115 1 ml 5x PDF PDF PDF 31 EUR Login to buy! 04-33-02015 20 ml 5x PDF PDF PDF 560 EUR Login to buy! Like all our products, the 5x HOT FIREPol® GC Master Mix is stable at ambient temperature for one month. This makes handling and set-up even more convenient, since no ice has to be used. The unique composition of the mix supports robust amplification of broad range of GC-rich targets. A total 14 GC-rich genes were amplified from human genomic DNA, using recommended reaction set-up and cycling protocol for 5x HOT FIREPol® GC Master Mix. Mix performs well with GC-rich amplicons up to 3000 bp. Good results are obtained also with Fragment Analyzis (DAT/SLC6A3). Shipping and temporary storage for up to 1 month at room temperature has no detrimental effects on the quality of 5x HOT FIREPol® GC Master Mix.